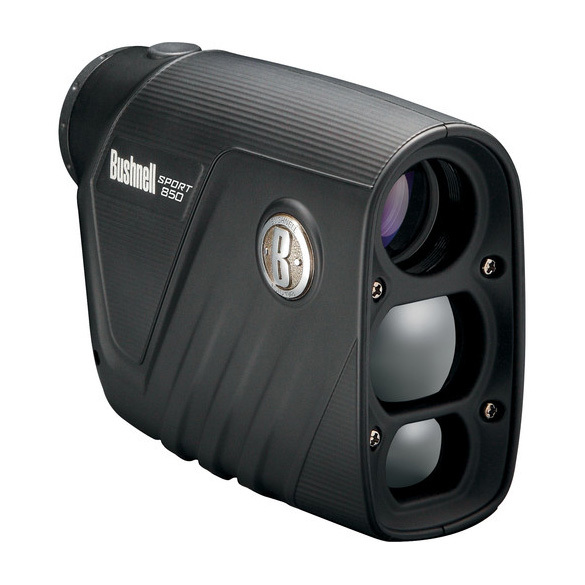 The Sport 850 4x20 Laser Rangefinder from Bushnell is lightweight and small enough to fit in a shirt pocket. It weighs less than 6 ounces and with dimensions less than 1½ by 4 by 3 inches it is not much bigger than a box of crayons. A single push button delivers the target range anywhere from 5 to 850 yards. Even in low light the optics are bright and crystal clear. It has a vertical, monocular configuration with a rainproof housing: it has been treated to prevent rain from soaking in. A 3-volt battery is included, as is a carrying case and a neck strap. This rangefinder has a battery-life indicator, a Posi-Thread battery door, and a sure-grip finish. This is a rangefinder that should be in every hunter, nature viewer and sportsman's knapsack.